One of the beautiful symbols we love of the fall season is the cornucopia! We put a twist on the classic symbol by giving an update to an old weathered queen conch shell. Ever wonder how such a beautiful shell is made? It’s made by a snail that extracts calcium from the water and hardens it with protein from a special tissue layer in its body. Its shell grows with it, so it never changes shells! So here’s our DIY adventure in case you have an old conch shell in the attic needing some TLC. Unfortunately, queen conchs are being overharvested to the point that scientists are concerned about their future. So be kind to the sea and leave the conchs in the shell shops, which contribute to this overharvesting. Garage sales and antique shops can be a great place to find conchs. we used ones that were in a decorative pot, but you could hot glue floral or wreath wire to pine cones, leaves, etc. The picture shows white chalky paint, but I didn’t end up using it. I originally had a different plan, but changed it as I went! Also, the picture doesn’t show the brown ribbon, but I added it to complete the cornucopia look. With the dark brown paint, paint all of the knobby parts. 2. Once the knobby parts are all painted, run your brush lightly over the rest of the conch shell so that paint lands on any raised ridges. It’s amazing to see nature take care of the intricate details in the woven look of the shell’s ridges. I had no idea that this was going to look this way! 3.Continue working the brush over the entire surface of the shell, using more paint as needed. Be sure to work the brush in the area between the knobs too. 4. Once dry, flip the shell over so that you can paint the interior of the shell. I used a watery brush along with the paint to smooth it on. It started to drip down, and since I liked the way it looked, I let it dry that way! 5. While you’re waiting for it to dry, arrange the wired decorations together in groups (I did groups of 3). 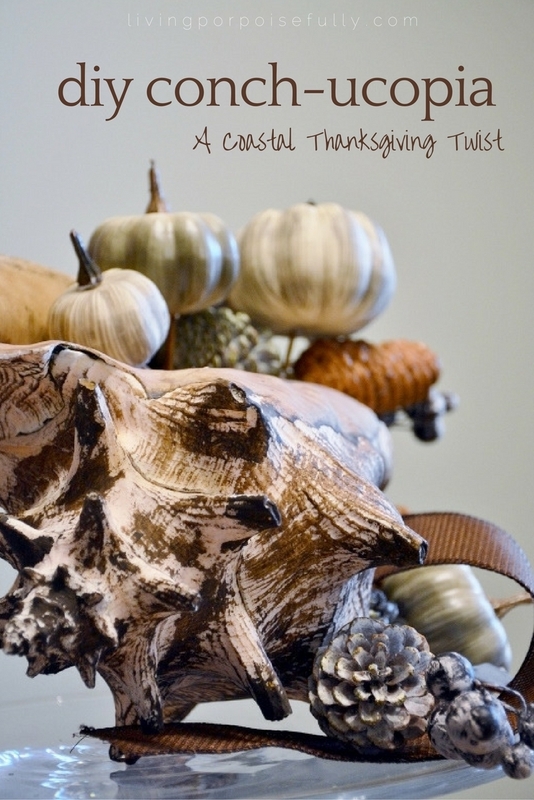 Our Thanksgiving table will get a touch from the sea, along with the beautiful meaning of the cornucopia (conch-ucopia!). We hope you are having a wonderful fall and take time to fully appreciate the abundance of blessings in your life.